Check back next week to see our picks for week three, and how the players performed that we picked the week prior. See the bottom of this article for details. Beebe, a 6-foot-3, 252-pound senior, has been a four year starter for the Pirates with 379 career tackles. He had a breakout performance on Friday with 17 tackles against Lansing. It was a big weekend for Beebe, as he picked up a KU offer on Saturday. Beebe now holds offers from Air Force, Kansas and Minnesota. 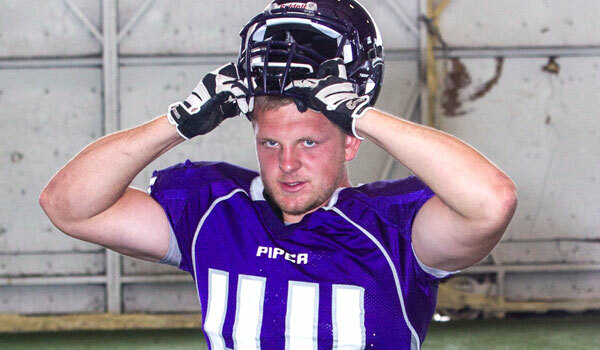 Although a big time high school linebacker, many schools want him as a fullback in college. The Stags running back burst on to the scene in the first week with 225 yards and three TDs in Miege's big win over Blue Valley Northwest. The Stags can score and Dawson is the perfect complement to Ryan Willis and Miege's high-flying passing attack. He could put up big numbers against a Gardner-Edgerton defense that was gashed by Shawnee Mission East last week. The senior running back shined in his first game with the Quinter Bulldogs. Goldsby, who transferred from Garden City High School, rushed for 237 yards and four touchdowns on 23 carries, while catching one pass for a 38-yard touchdown. Expect Goldsby to have another big game during Quinter’s home opener against Hoxie. Haas played in just the final six games as a sophomore, but recorded 11, five, seven, 16 and 10 tackles in his final five contests. That stretch included two tackles for loss and an interception. Haas, a 6-foot, 200-pound junior, finished with 15 tackles, five more than any other Railer, in a season-opening 46-0 home loss to Norton. On Friday, Ellis plays Thomas More Prep-Marian. The teams are in the same county and separated by about 15 miles, but Friday marks the first football game between the teams since 1953. Tiernan is on pace to be statistically one of the top quarterbacks in Kansas 8-Man history. The 6-foot, 190-pound junior is an accurate passer with a great understanding of his dad’s offense. A Kpreps 8-Man, Division I All-State selection from a season ago, Tiernan set the state record for completion percentage in a single season at 78 percent. He passed for 1,653 yards and 28 touchdowns against only five interceptions. In last week’s 52-28 win over then 8M-II’s top-ranked Thunder Ridge Longhorns, Jake completed 18 of 25 passes for 217 yards and four touchdowns and rushed for 93 more yards. He’ll need a similar performance as his Bulldogs take on 8M-II’s top-ranked team for a second consecutive week when they travel to Beloit St. John’s-Tipton. After accounting for over 2,300 total yards of offense and 36 TDs last season as a sophomore, Zac Walter kicked his 2014 season off in style last Friday. The 6-foot, 185-pound quarterback rushed for 204 yards with four touchdowns, completed 6 of 8 passes for 87 yards and two more scores, and returned a kick 75 yards for a score -- giving him a hand in all seven Leopard touchdowns in last week's 52-6 win over Tescott. This week the Leopards travel to play county-rival Sylvan-Lucas and a Mustang team coming off a solid season opening victory over Natoma, 46-14. The Mustangs will keep this game close, but a healthy Walter will be counted on to play big in this big game.